Pack your bags because this game is going to take you on a trip around the world! Click here to play! 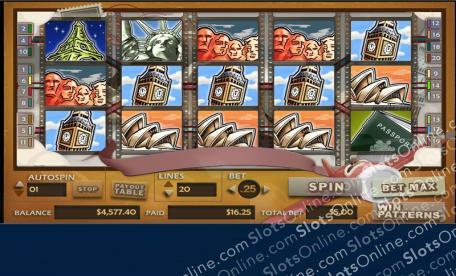 You’ll be seeing the sites and collecting cash as you spin the reels of this amazing game. Jump aboard the airplane to start your trip. This air born vehicle will be key as you take your trip around the world as it is a wild symbol and will replace most other symbols to help you bring in more wins. It will also pay out up to 30000 times your line bet if you can spin two to five of them across an active payline. The first stop is Paris and the Eiffel Tower. Spin three to five of the iconic structure and you’ll get 10000 times your line bet. Next up is China. Spin three or more pagodas to gather 5000 times your line bet. There are plenty of other sites to be seen in this around the world adventure. These include the Statue of Liberty, Mt Rushmore, the Sydney Opera House, Big Ben, and plenty more! As you spin these reels to see the sites, be sure to keep your eye on the globe symbol. This helpful icon is a scatter and will trigger a number of free games. Take to the skies to travel the world and you could pick up some amazing cash prizes! The globe is a scatter in this fantastic game. If you can spin two of them anywhere in the window on a 20 line bet, you will win your bet back. Plus, if you spin three or more anywhere on the board you will trigger a bonus game! The airplane acts as a wild. It will not only replace other symbols, excluding scatters, to help you bring in more wins, but it will also pay out the top prize of 30000 times your line bet if you can spin five of them across an active payline. Spin three or more scatter globes anywhere on the board to trigger a bonus feature. During this game you will be navigating a hot air balloon while you sail through the skies. Use the balloon to grab floating treasure boxes, but watch out for vultures as they will make you lose control.